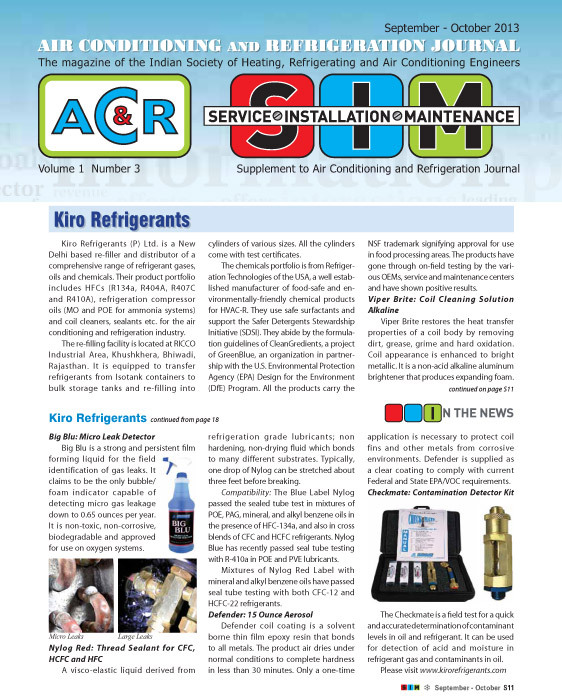 Kiro Refrigerants (P) Ltd. is a refiller and distributor of comprehensive range of refrigerant gases that covers the requirement of a rapidly changing industry. Our main objective is to make our brand “KIRO” synonymous with high quality and epitome of customer satisfaction. Refrigerants are imported in various packing sizes from small refillable cylinders to ISO tank containers. We have our own individual bulk storage tanks for each type of refrigerant gas. Kiro operates strict policies for product quality, health management, safety and environmental concerns. Stringent quality checks at all crucial stages of refilling & our own in-house laboratory equipped with latest technology apparatus ensures compliance of international standards. We also provide sound technical back-ups and support to our clients. Since 1980, our promoters had been providing spare parts support to the air-conditioning and refrigeration maintenance and repair market. This has held true to this day with our continual search for better products and improved services. After having garnered the experience in the local refrigeration and air-conditioning industries the promoters felt the need to be more specialized to cater to the growing market. And thus Kiro Refrigerants( P) Ltd was set up in 2012. "The re-filling facility with technical & commercial back up of Kaltech is already set up at RICCO Industrial Area, Khushkhera, Bhiwadi .This facility is fully equipped to transfer refrigerants from ISOTANK Containers to bulk Storage Tanks and re-filling into cylinders of various sizes. Kiro has already been approved by Arkema, France for distribution of their complete HFCs range for Indian market. Also, Kaltech (Equity Partners) has been representing Arkema for over 7 years for Singapore and other mutually agreeable markets. Their client list in Singapore already includes Carrier, Carrier ARCD and Carrier Transicold, Johnson Controls, Trane, Mayekawa, Daikin Asia, Unitor, Drew Ameroid, SMRT (Singapore Metro), SBS (Singapore Bus Services), Comfort Delgro (Singapore’s biggest Radio Taxi Operator) etc." Arkema, France for “Forane” Refrigerant Gases viz. R134a, R404A, R407C, R410A, R507, R32 etc. Xaerus Performance Fluids LLC., USA for Compressor Lubricants – Mineral, POE, Semi-Synthetic for Ammonia, PAG, Vacuum Pump Oil, etc. Refrigeration Technologies, USA for various HVACR Chemicals viz. Leak Detectors, Sealants, Coil Cleaners, Degreaser, Kits for Acid & Moisture detector in Compressor Oil and Refrigerant Gases, etc.